After a lot of back and forth in my head about what I want in a mesh head and what I don’t prioritize, I decided the quality of the new Catwa Mesh Head was worth it – and especially as there are so many good makeup appliers that are already available for Jessica. Out of all the mesh heads I own, Jessica is the most “chameleon like,” allowing for incredibly diverse looks depending on which applier you’re wearing. That alone makes it super valuable if you’re a mesh head fan. I picked out three appliers that I really liked from Modish, The Skinnery and Essences, from left to right. The looks are all incredibly different – mature to young, even though the tones are all quite fair. I can see wearing Jessica and the various available and upcoming appliers for a very long time. It actually makes the steeper price a lot less steep if you think about the long-term wearability. I am glad I waited until V4 arrived to take a closer look at Jessica. It seems like any kinks in the product have been mostly worked out now. With the head you get a main HUD and a hairbase HUD. The main HUD includes all the expressions, animations, etc. you have been hearing so much about. I don’t really use these, so I turned them all off, including the blink (which is nice and realistic). But you can also control the very basic eye and mouth positions here too, which I use all the time (and these are excellent). 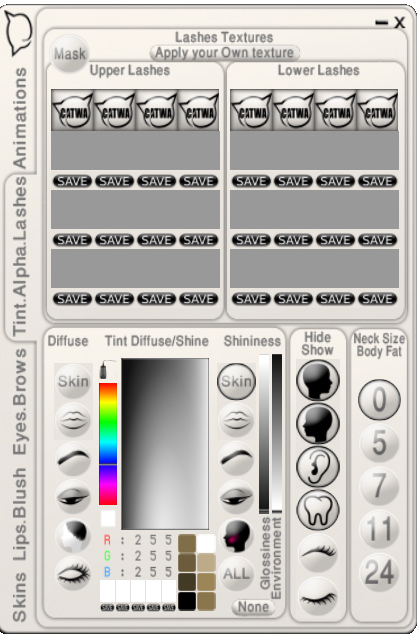 The other tabs are simple and easy to use for saving all your appliers and tuning your makeups and lashes. I actually turned the lashes off and fitted my own from Izzie’s, as the only mesh head with lashes I really like is from Rowne so far. In addition to the lashes, which I turned off, I find the ears quite large. You can hide them and add your own but they really should be quite a bit smaller. Beyond that, I haven’t figured out what the Diffuse and Tint Diffuse/Shine features do yet but I may play with those in the future. Basically, the HUD includes everything you need to customize for your head, all in one place. This is the polish that every head really should have. Bravo, it’s perfectly done. This is a purchase that made me a little uneasy to start, given the price, but I was quickly happy that I made it. I love the softness of the head and most of all, that it can literally take on any look you want with different skin/makeup appliers. I would seriously give Jessica a demo if you’re a mesh head collector like me – or even if you’re just starting to try them out. I am immediately adding this head to my recommended page. It was a good buy with a lot of long term wearability.